Yes Yes I know I just posted these cinnamon roll pancakes and they were delicious! But why stop at one good thing? These waffles don't actually have the cinnamon sugar cooked into it like the pancakes do, but oh how I love the massive amount of cinnamony sugary goodness that is on top of these bad boys! These waffles are not for anyone who shies away from sugar. These waffles are delicious and sweet as if you were eating a cinnamon roll, but instead they have little grooves for all that goodness to fill. Once in your mouth they turn into pockets of goodness that leave you taste bud screaming for more! Completely decadent breakfast treat- like a deconstructed cinnamon roll, turned into a waffle. 1. 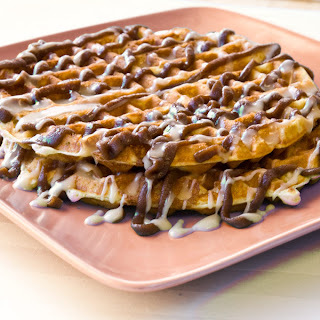 Prepare waffles: In a medium bowl, whisk together flour, sugar, baking powder, baking soda and salt. Make a well in the center of the mixture; set aside. 2. In a separate bowl, whisk together eggs, buttermilk, oil and vanilla. Pour into the bowl with the dry ingredients. Stir just until moistened; batter will be slightly lumpy. 3. Preheat a waffle iron and spray with nonstick spray. Pour batter into waffle iron grid and close the lid. Bake until waffles are completely done- follow your waffle iron's instructions. Use a fork to remove finished waffles. Repeat with remaining batter. Keep waffles warm until ready to serve (a 200 degree oven is perfect). 4. Prepare cinnamon topping: In a medium bowl, mix butter, brown sugar and cinnamon. Scoop the filling into a small zip baggie and set aside. 5. Prepare cream cheese topping: In a medium, microwave-safe bowl- heat butter and cream cheese for 30 to 60 seconds; just until melted. Stir together until smooth; whisk in powdered sugar and vanilla extract. 6. When ready to serve, place waffle on plate, drizzle cinnamon topping, then drizzle cream cheese topping. Use as much or as little as you'd like. Serve immediately. I first found this recipe here which took me to this site who got it from here :) Thanks to all of you for the amazing recipe! I know several young men who would run you over to get to these. Amazing! Oh my, oh my goodness. this is too good to be true.